On the cover, this vintage microphone which has seen many decades of stagecraft represents the embrace of electronic devices for nearly all forms of entertainment. The theatrical setting with its subdued light invites the reader to join in the fun. We offer you a front row seat to Cheshire Academy's repertoire of talented students, faculty, and alumni who bring the fina and performing arts into our lives and add inspiration to our days. Reconnect with Cheshire Academy at one (or more) of the many exciting events held by our Alumni and Development Office, both on and off campus. Want to host an event in your hometown? Looking to meet up with someone from the Development and Alumni Relations Office while they are on the road? Contact us and we will help you make it happen. Alexis “Lexe” Holmes ‘18 took this photo of a door knocker during a photography field trip to the Met Cloisters this past fall. Students had the opportunity to photograph new subject matter and explore the creative side of photography. What goes into a future leader's college application? 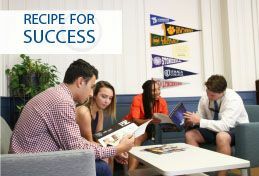 For juniors, seniors, and postgraduates at Cheshire Academy, the ingredients include one-on-one coaching with trained college counselors, mock interviewing with real college admission officers, and attending the college fair. However, tuition only covers a portion of the cost of operating Cheshire Academy. The rest of the ingredients for these students' successes come from generous donors like you, who help to bridge the gap between tuition dollars and the Academy's operating budget with gifts to the Annual Fund. Cheshire Academy archives past issues of 1794 on Issuu, which allows for readers to flip through pages on their computer much like the tactile experience of reading a printed magazine. You can find links to volumes of 1794 on Issuu below.